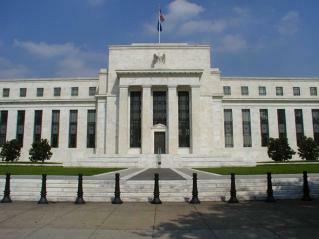 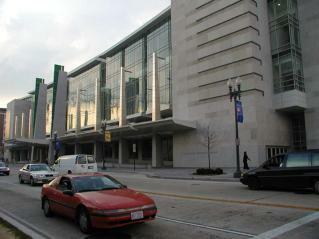 The following galleries contain images of James Sanborn artwork in the Washington DC area. 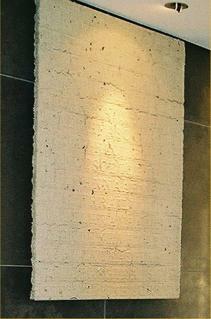 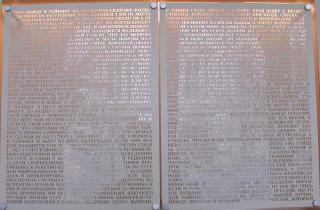 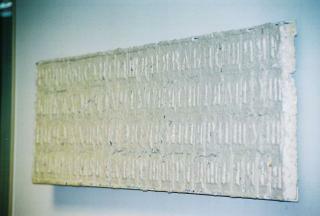 Photos taken by Elonka Dunin, in 2003. 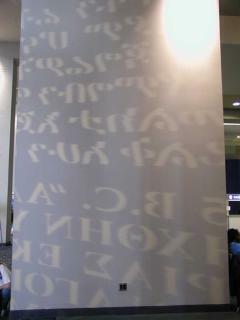 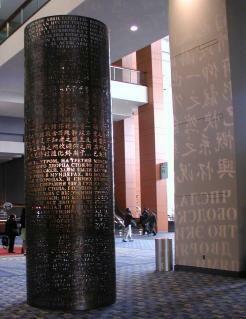 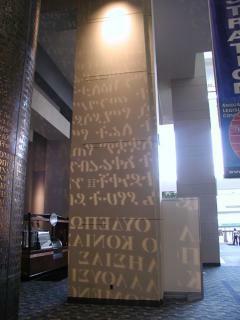 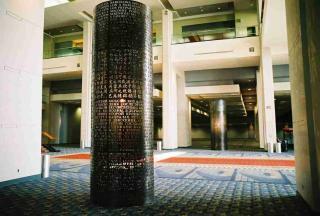 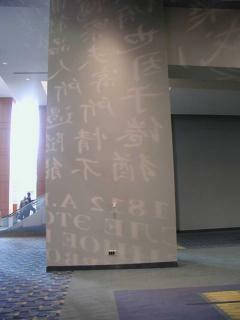 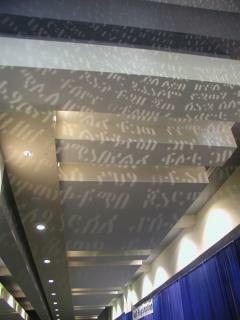 These are images of the Lingua sculpture by James Sanborn, located at the new Washington DC Convention Center. 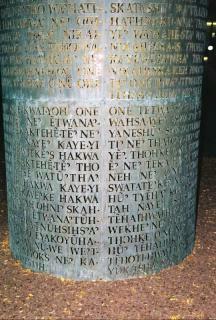 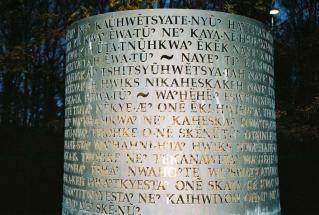 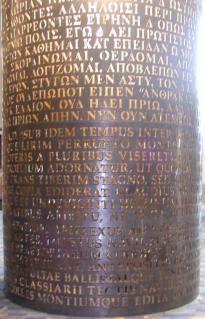 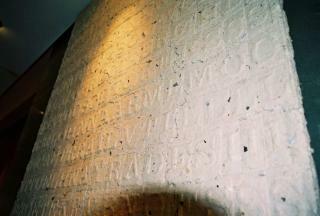 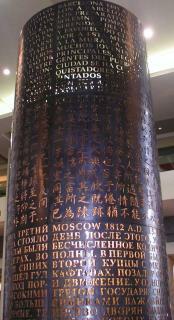 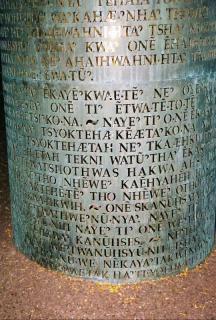 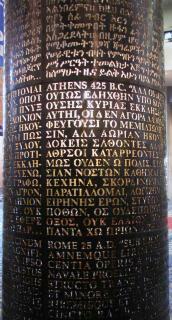 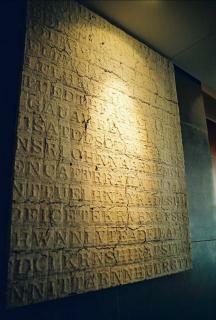 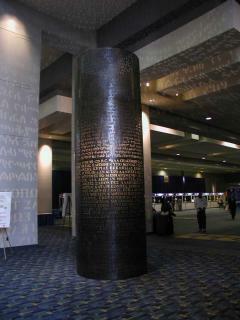 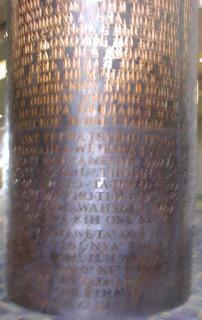 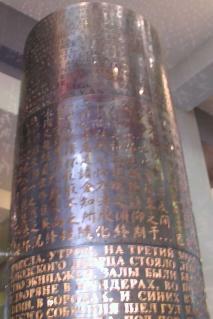 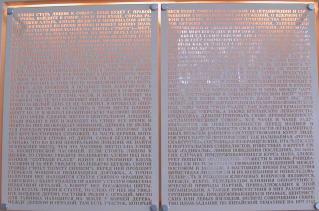 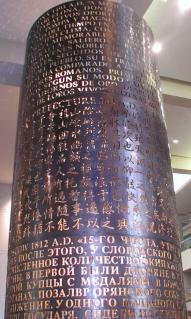 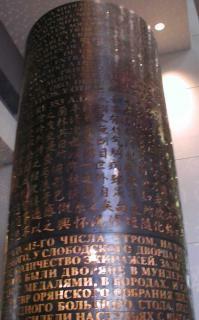 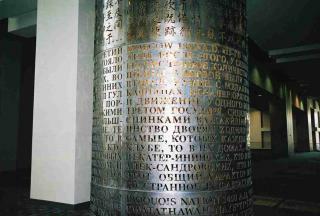 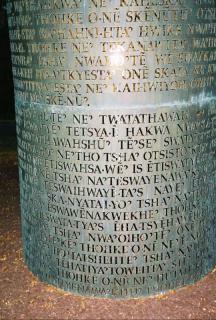 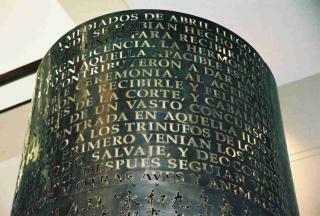 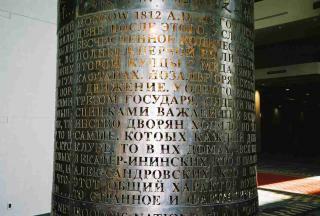 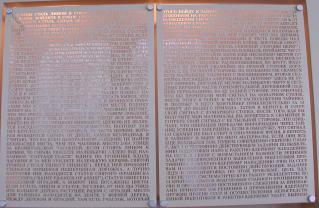 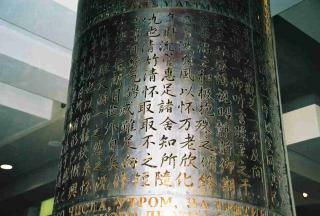 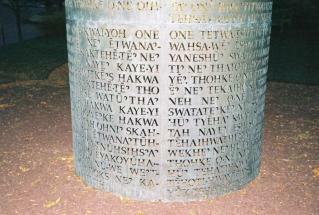 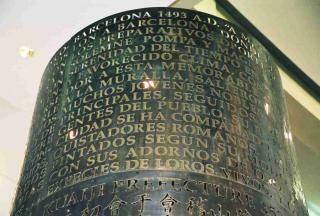 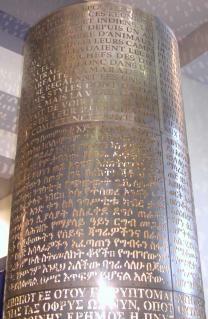 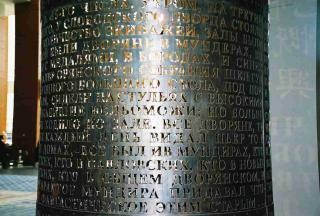 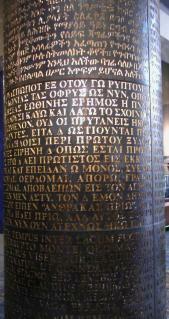 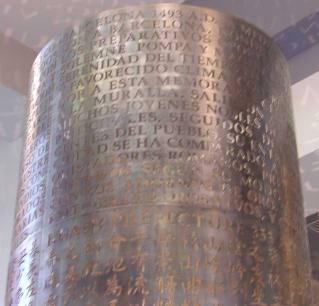 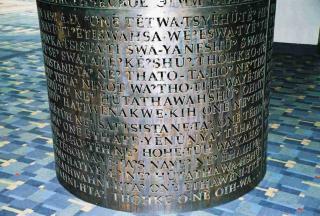 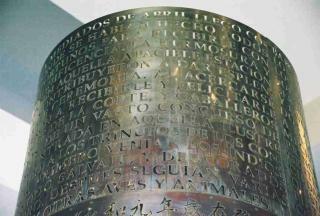 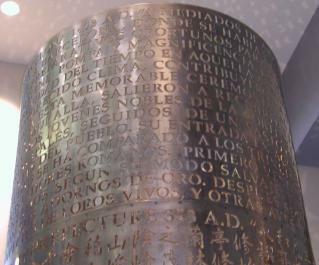 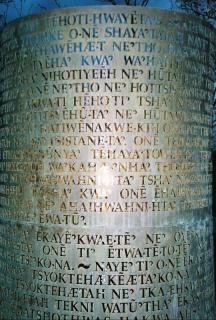 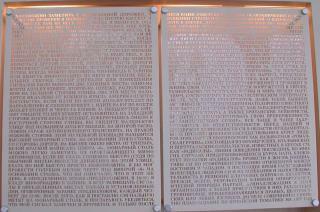 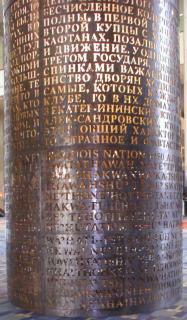 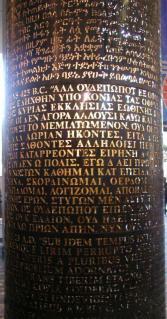 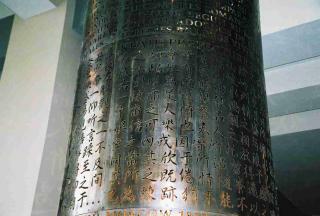 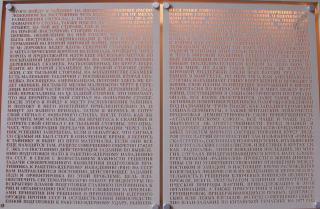 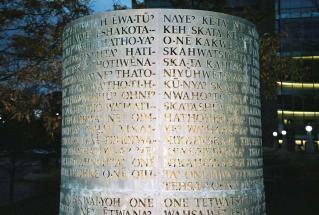 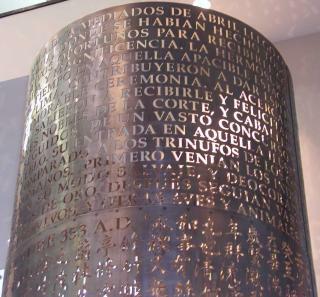 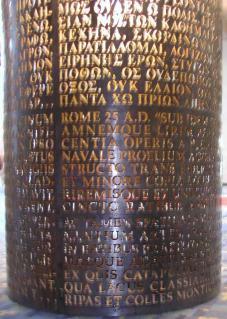 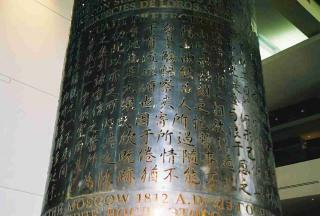 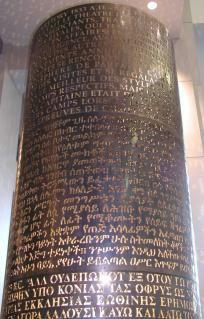 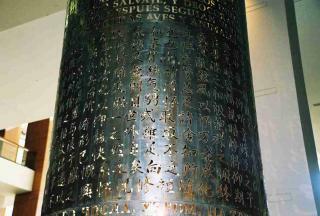 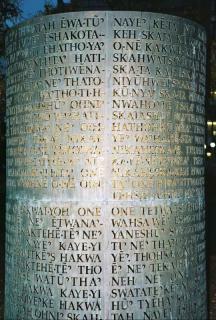 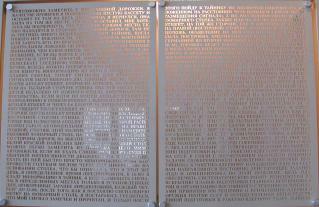 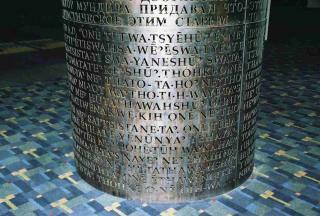 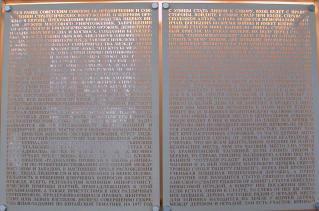 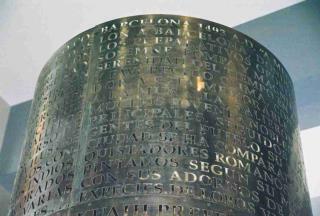 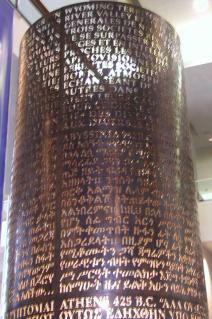 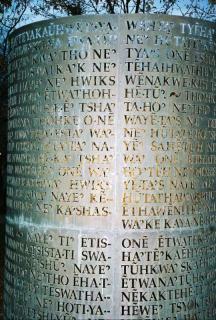 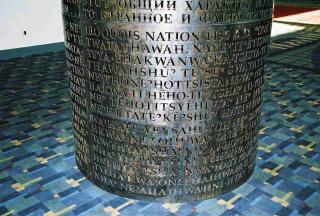 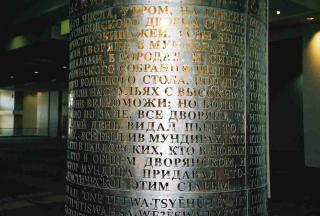 The sculpture consists of two 16-foot-tall cylinders, each of which is covered with rings of text in multiple languages: Chinese, Russian, Iroquois, Ethiopian, Spanish, Latin, Greek, and French. 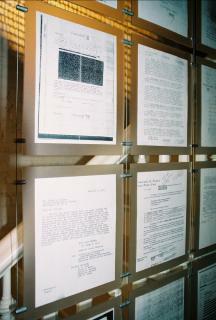 Photos taken by Elonka Dunin. 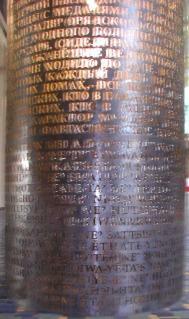 Please also see Xenon's images for additional photos. 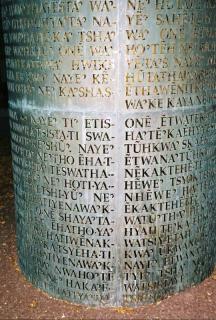 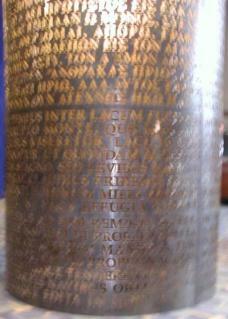 These are images of a cylindrical sculpture outside a courthouse in the DC Area. 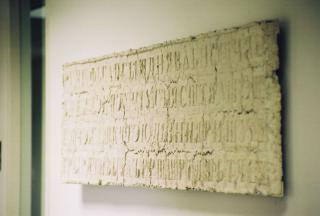 Photos taken by Elonka Dunin. 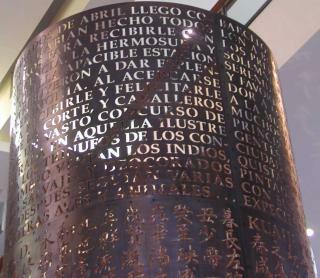 These are images of various sections of the Zola Spy Restaurant, which is next door to the International Spy Museum in Washington DC. 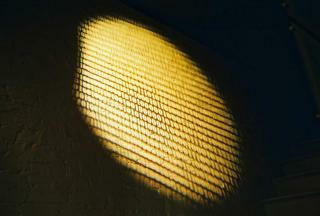 Photos taken by Chris "Xenon" Hanson and Elonka Dunin. 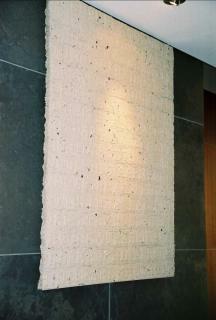 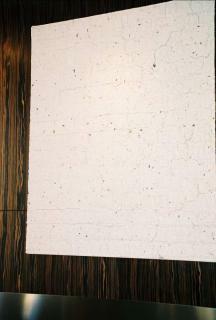 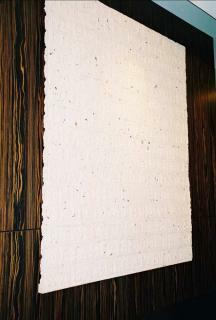 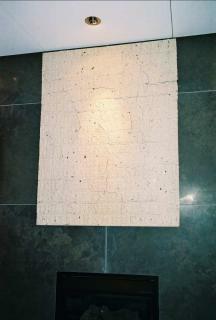 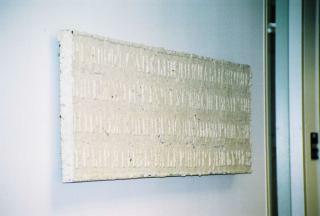 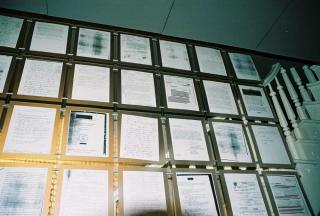 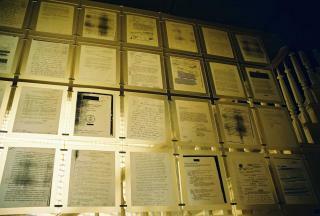 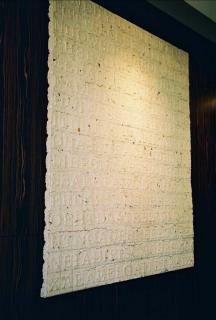 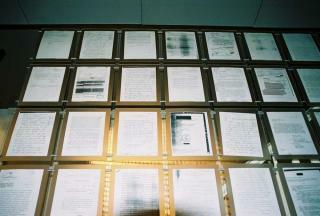 The following are images of a Sanborn Pulped Document piece called "Covert Operations Fragment", which is part of the art collection of the Federal Reserve Board Art Gallery. 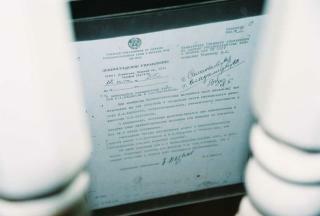 Photos taken by Elonka Dunin.